The sugar industry plays a vital role in the world’s economy. It also affects the environment directly and indirectly; hence, greenhouse gas (GHG) emission estimation and energy savings in the sugar industry are very important. To improve the efficiency of the plant and analyze the life cycle energy usage and emissions from the sugar industry, a complete Life Cycle Assessment (LCA) is needed. A major portion of sugar is produced from sugarcane. Sugar is produced as the main consumable product; molasses and bagasse are byproducts and filter cake is a waste product. These byproducts and waste products are used again for different purposes. The capacity of sugar plants in the present study is 12,000 tons of cane per day in a sugar mill, 60 MW in a cogeneration power plant, and 270 kL per day in a distillery. The LCA mainly focuses on primary energy usage and its externalities. 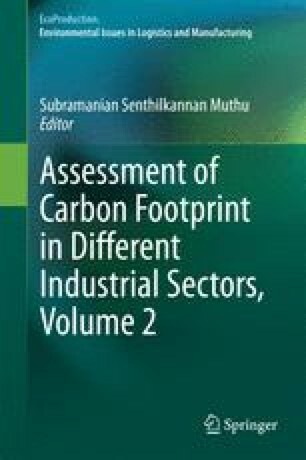 In this chapter, energy usage and GHG emissions from the sugar industry were obtained through an economic input-output model. A comparative analysis of GHG emission has also been carried out using a process chain analysis approach. The authors thankfully acknowledge the authorities of Dhampur Sugar Mills Limited (DSML), Dhampur, Uttar Pradesh, for visiting the sugar industry and providing valuable data.